Catherine Estrampes is President and CEO of GE Healthcare Europe. She leads a team covering 45+ countries that provides healthcare technologies, Services and Solutions to healthcare institutions. 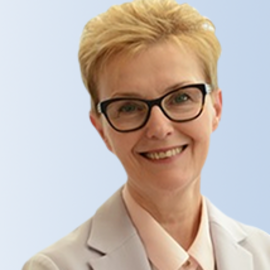 Catherine began her career at GE Healthcare Europe in 1990 where she held business leadership positions for the Cardiology, Interventional and CT product lines and gained extensive international exposure. She moved to the US in 1999 for GE Capital where she held several General Manager roles both for GE Capital Equipment Finance and GE Healthcare Financial Services Global Vendor division. Catherine moved back to GE Healthcare in October 2010 to the position of Senior Vice President and General Manager heading the Mid America business unit. In January 2013, her responsibilities were expanded to include the entire Central corridor of the GE Healthcare U.S & Canada. Catherine returned to the Europe organization early 2017 as Imaging Leader before taking over the position of region CEO in October.